On the fringes of Essaouira outside the cannon-studded walls the callous winds roar and the sun glints against the ocean waves. Windsurfers test the roaring waters off the coast, but inside the city is a relaxing and mystic atmosphere. The narrow streets of the Medina are enclosed by whitewashed walls of ancient French and Portuguese architecture with cobalt blue windows and doors. All along the port the fishing boats rock the shores, and fishermen unload their days catch and trek along the sandy dunes. 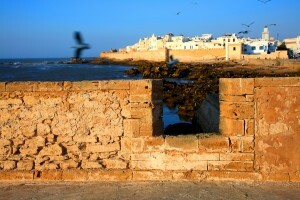 Essaouira would make a perfect green getaway. The streets are kept clean and there are no cars in sight all throughout the Medina. It is one of the most relaxing cities in all of Morocco. Tiles adorn the archways, patterns so intricate they could leave you staring for hours. Endless hotels line the coast overlooking the Atlantic waters. This sea-side medieval town is host to a variety of attractions. 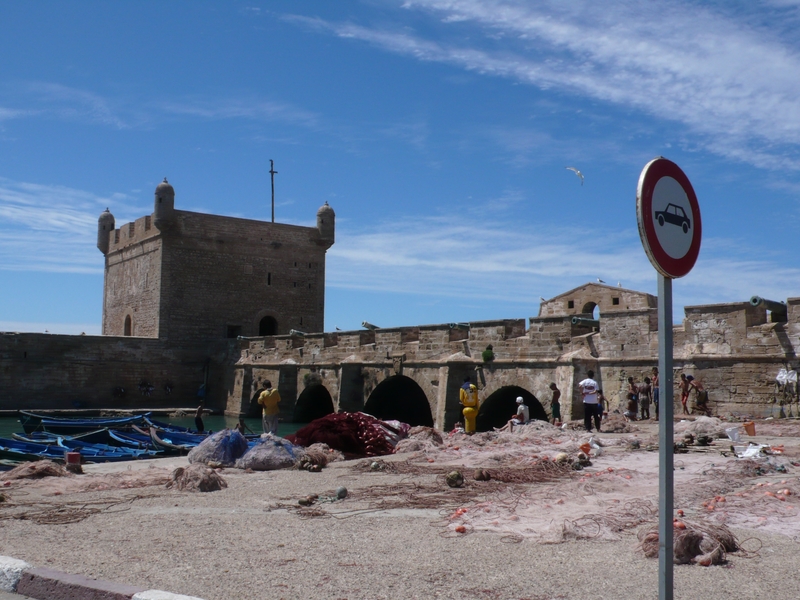 Essaouira is the perfect tourist stop. 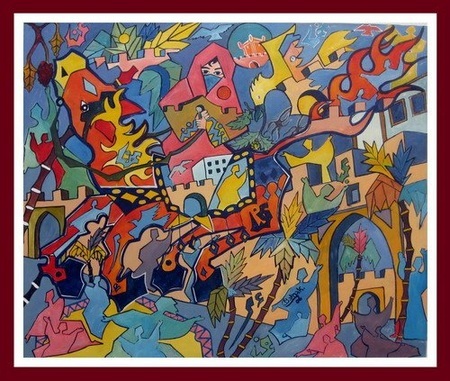 It has an array of art galleries, mouthwatering seafood, wood workshops, and souks filled with jewelry and spices. 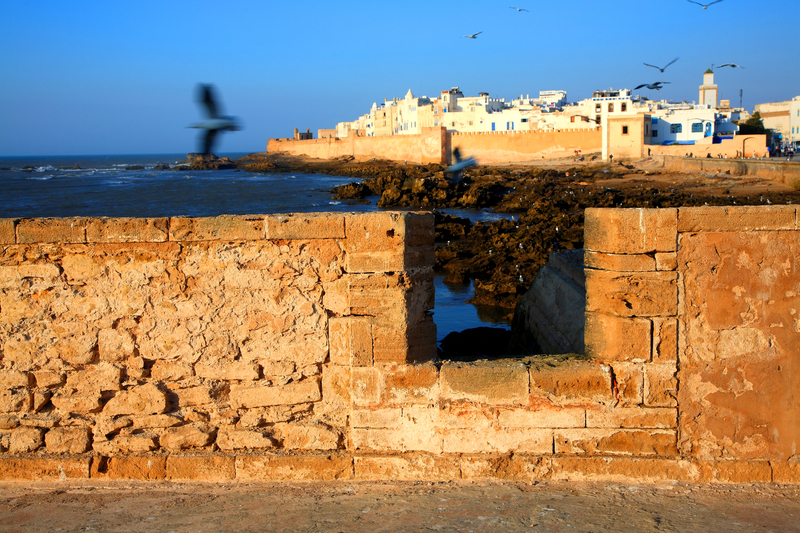 Essaouira is a great city to enjoy the relaxing and serene Hammans of gentle waters and exfoliating treatments and full body massages. Each June world rock, jazz, and reggae musicians and international artist flock to Essaouira to hosts The Gnaoua Music Festival. 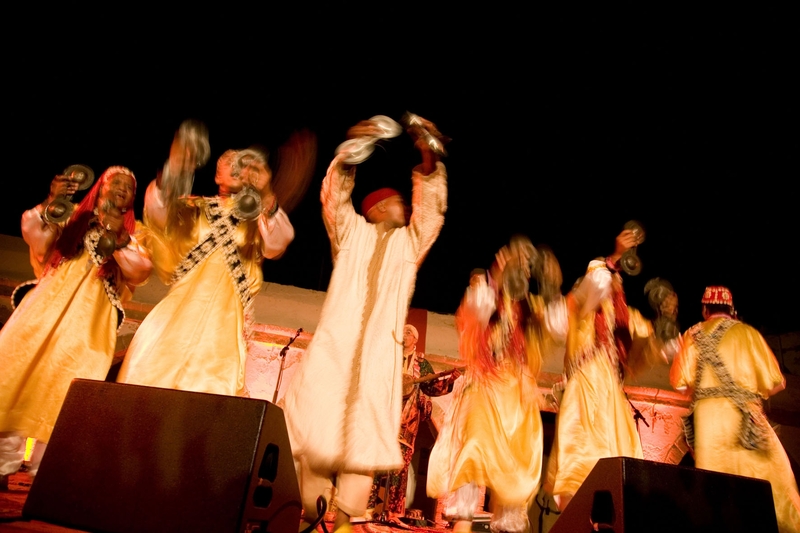 This annual festival is Essaouira’s main event and attracts an audience of 500,000 Gnaoua enthusiasts. This festival runs for four days, and offers 10 different concert sights. This festival is a showcase of different talents of music mysticism and attracts some of Gnaoua’s most ardent followers. 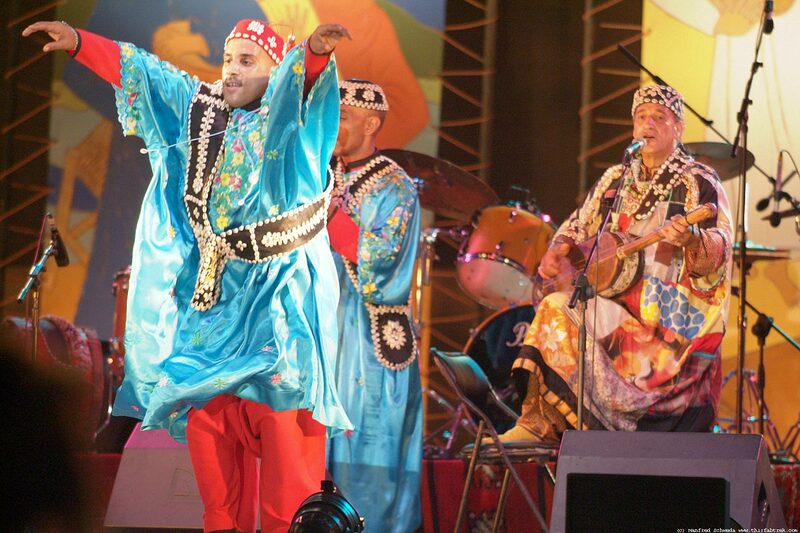 The festival emphasizes Gnaoua’s heritage and recently honored the musicians with a new stage. One this main stage there are Gnaous Zaouia, aka “trance performances,” and traditional lilas. During these concerts followers have been know to fall into trance. 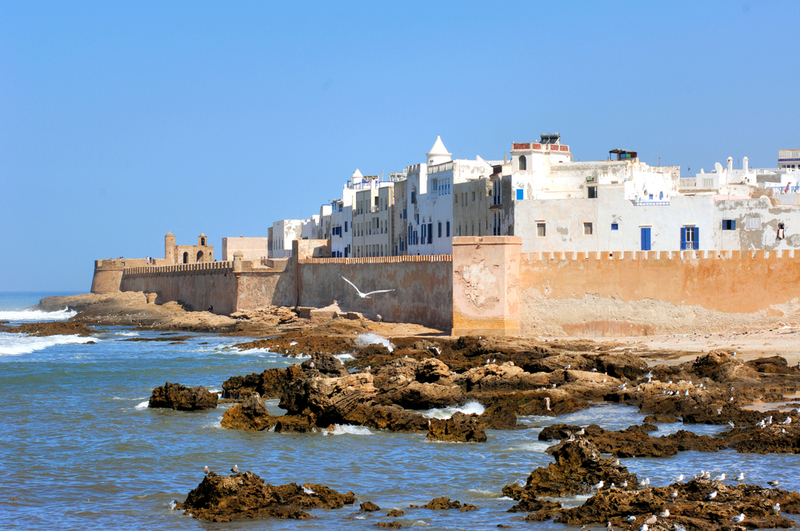 Essaouira was once the stomping ground for Hendrix, Stevens and Marley, and was even what inspired Hendrix’s lyrics to “Castles Made of Sand.” The traditional Berber music is played with a three string instrument resembling a guitar, a type of lute, with a oval soundbox. The music also contains large “ganga” drums and metal castanets. 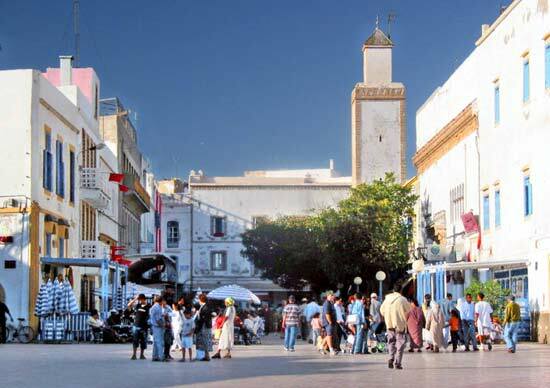 For travelers interested in wandering the serene streets of Essaouira, or getting lost in the maze like Medina, make sure to check out this annual festival that has been know to stimulate the senses!